A worldwide provider of full-service IT solutions to SMBs all the way up to Fortune 1000 clients, Paranet Solutions services clients through an extensive suite of managed IT solutions, aiming to reduce and manage client risk, improve efficiency, and optimize infrastructure and processes to create an enhanced, sustainable IT environment. Paranet’s previous website did not reflect the company’s comprehensive professional expertise both as it relates to organization, content and design. It also did not reflect its client base. As a professional IT solutions provider for companies of all sizes, including top-tier clients, Paranet’s new design would need to look crisp and modern to appeal to its corporate clientele. Practically, it would need to focus on the information clients and prospects require most and thoroughly but concisely explain Paranet’s extensive service offerings. A sleek new website was designed to appeal to Paranet’s high-end, corporate clientele. Whereas the old site included archaic stock photography, the new design features graphics and illustrations reflective of Paranet’s branding and professionalism. Already a client of HubSpot, Paranet previously hadn’t been utilizing the HubSpot platform to its ultimate functionality. The new website, in contrast, integrates social media marketing, custom web forms designed to increase leads, and landing pages promoting specific products and services. 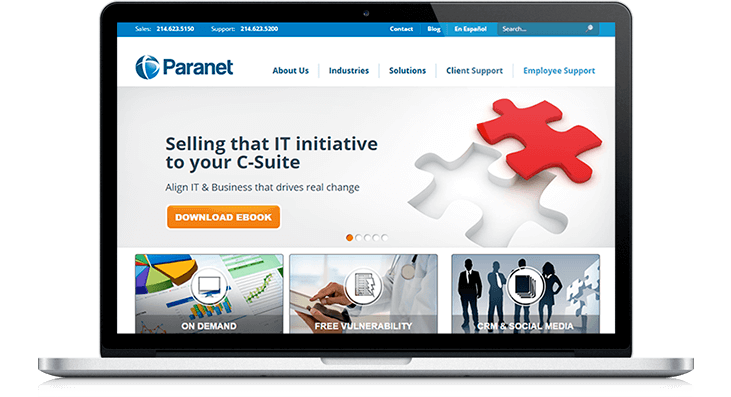 The blog was updated in look and feel to allow the Paranet Solutions team to engage clients and prospects with fresh, current content.